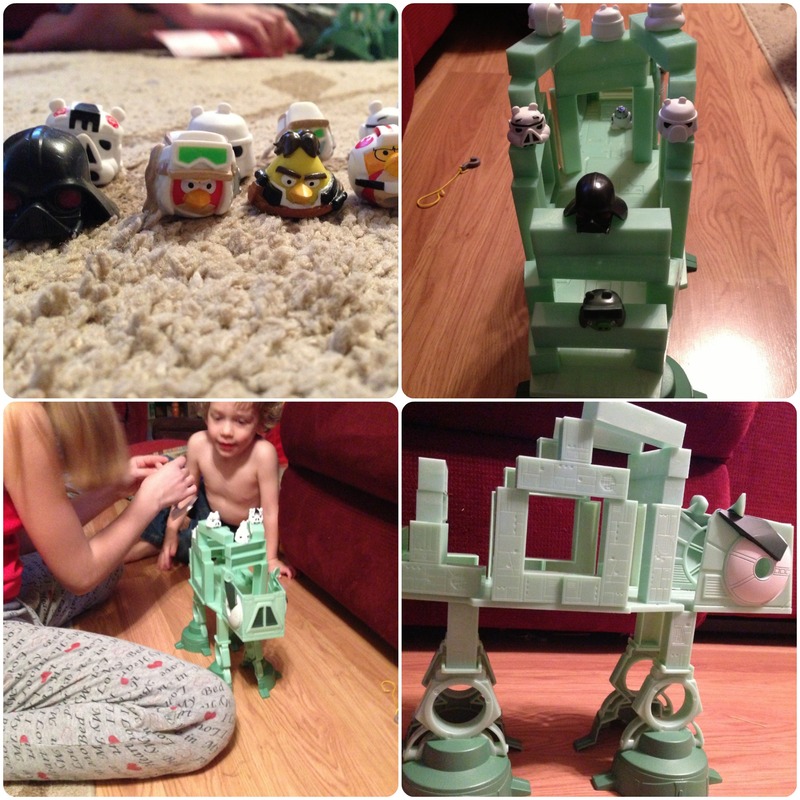 I was given the Angry Birds Star Wars AT-AT Attack game to review… all thoughts are entirely my own and those of my family who played with it a heck of a lot more than me. Yes, I’ve seen every single Star Wars movie more than once and yes, we own them too. Well, just the original ones because they’re the ones that are actually the best (I know that statement might stir up some reactions…) and to age myself when the Empire Strikes Back came out for the first time way back in … 1980-something I was there in the theatre watching it. I loved the Ewoks! Coming up this weekend is Star Wars Day! Did you know that? May 4th is Star Wars Day… May the 4th be with you…. is considered a holiday to celebrate the Star Wars movies. Here’s a bit of info that I be you didn’t know. The six live-action movies of the Star Wars saga debuted in May (starting with the original Star Wars on May 25, 1977) and this year, May 25 marks the 30th anniversary of Return of the Jedi. The month of May includes George Lucas’ birthday (May 14, 1944), and has been the traditional start date of the popular Star Wars Weekends at Walt Disney World Resort (this year, the fun begins on May 14). Will we celebrate by watching the movie? Maybe if I remember but I know that we’ll be playing the new Angry Birds AT-AT Attack Battle game! I will tell you that trying to set this up with a toddler who wants to help with everything is a definite challenge! I think that we tried 4 times before we finally got it all together and ready to actually play. Of course at that time one of the teens knocked it over with the foot rest on the couch because she thought her older sister said to do it! There are a few new Angry Birds Star Wars games that are here just in time to celebrate Star Wars Day! Stack, launch, and destroy with the AT-AT ATTACK BATTLE GAME, which includes 21 blocks to create the signature AT-AT, a LIGHTSABER LAUNCHER and 12 ANGRY BIRDS STAR WARS figures — including two that are exclusive to this set! Players can also unlock ANGRY BIRDS STAR WARS in-app content with a special code in each pack. So the here’s the giveaway part! One lucky winner who resides in the U.S. will get their very own Angry Birds Star Wars AT-AT Attack game! And all you have to do to win is tell me which Star Wars movie is your favorite and why! Yup… that’s simple and nothing more. Just make sure that your email address is visible so I can contact you if you win! Like I said earlier.… I was given the Angry Birds Star Wars AT-AT Attack game to review… all thoughts are entirely my own and those of my family who played with it a heck of a lot more than me. Giveaway fine print…. one winner from the U.S. will be selected (using random.org) and they will have 48 hours to respond before another winner is selected. Giveaway ends at 11:59pm on May 3rd.